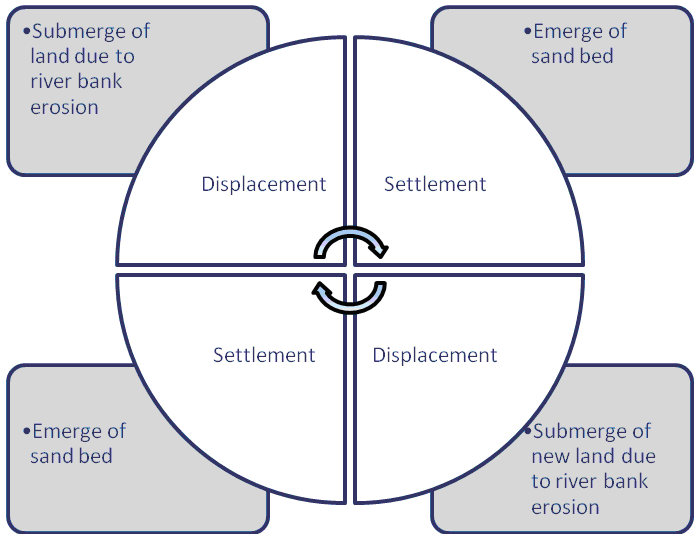 "River Bank Erosion Induced Human Displacement and Its Consequences"
Impacts of river bank erosion are multifarious: social, economic, health, education and sometimes political. The first and foremost impact is social, i.e., homelessness due to land erosion which compels people to migrate (Figure 8*). After forced migration they suffer from economic crisis, namely loss of occupation and loss of property, and they are at the risk of poverty and sometimes involvement in criminal activities (Iqbal, 2010). Identity crisis is inevitable to these migrated people as their belongingness to any particular district or state or country is often denied. Other consequences of bank erosion are the lack of medical and education facilities. Medical care units that were on the eroded land are all lost. In their new settlement generally those are lacking. So, they have to travel longer distances than before and bear extra cost for medical treatment. Similar is the case for education. Moreover, due to loss of occupation they are having difficulties to spend money for purposes other than essential items like food and shelter, even if the medical and education facilities exist in their new occupied placees. Results are their poor health, sickness and illiteracy of their children. Most of the studies on Brahmaputra river bank erosion in Assam have been aimed at identifying factors causing erosion and assessment of eroded geographical area. Such studies are important for taking erosion control measures and restoration (Sarma and Acharjee, 2012). However, little effort has been made to quantify the loss due to this erosion though it is often reported that Brahmaputra River bank erosion causes poverty, has a long term impact and there is no compensation mechanism (Talukdar, 2012). It has already been mentioned that Brahmaputra bank erosion has wiped out a large area including human settlements, productive crop land and reserve forest area. One of such affected area consists of some community Development Blocks of Barpeta district of Assam. Such a Block is Mandia. A qualitative study in Mandia Block of Barpeta district revealed that people on the eroded land migrated to the nearest villages, towns and even to some reserve places of Assam due to Brahmaputra River erosion (Khan, 2012). In Mandia Block agriculture was the primary occupation of the majority of the people. But due to bank erosion there was loss of agricultural land, which in turn has increased the number of landless labourers. The percentage of landless labourers among the working class in the study area was nearly 90 percent, whereas it was only 16 percent in Barpeta district, where this block belongs. Decreasing agricultural land due to erosion and at the same time increasing number of landless labourers had obviously an impact on their livelihood. This was observed from a growth in number of poverty stricken people in Mandia Block. The portion of population below the poverty line in this block was more than double of that in Barpeta district. Poverty in turn escalated illiteracy and malnutrition of the children due to lack of education attainment and improper care for health. Existing medical centres in the previously eroded settlement were affected due to erosion. Moreover, in most of the new occupied places (generally, river embankments, road sides, or low lands, which are mostly inundated by flood) physical (viz., road, electricity, etc.) and social (viz., health centres, schools, etc.) infrastructures were either absent or not adequate. Brahmaputra River erosion created problems of identity, too. Sometimes the displaced persons were suspected as illegal migrants (as the Bangladesh border is very close to the study area), especially when they were in search for jobs for their livelihood. On the other hand, some displaced persons forcibly occupy lands in reserve forests, and caused deforestation which lead to not only ecological degradation, but also scarcity of fuel wood and fodder in the region. Thus, Brahmaputra river bank erosion has caused both socioeconomic and ecological imbalance. Another study area was the Shantipur Block in the Nadia District of West Bengal. This place is more than 211 km downstream of Farakka Barrage, and is situated at the left bank of the river Bhagirathi-Hooghly (one branch of River Ganges). The river here resorts to massive bank erosion. The socio-economic impact of bank erosion in some villages of this Block has been assessed in a study by Chatterjee and Mistri (2013*). Once, Methiadanga was a village in this block that had been gradually engulfed by the river. People residing there continuously shifted inward as the river was consuming the village. Population in this village shifted several times in nearly 20 years till the date of survey (Figure 9*). Finally, when the village was almost eroded, they were relocated about 2 km east of the river. State government provided displaced villagers free land (Patta). The displaced people lost their houses, industrial set-ups (handlooms), multiple-crop lands and cattle. Their losses were estimated in monetary terms. The range of their losses was 50 000 – 200 000 Indian rupees (Figure 10*). Even the loss of a few people exceeded 200 000 Indian rupees. This loss, mainly multiple-crop-land, made them (who were previously farmers) unemployed, and they were bound to do informal jobs like rickshaw-pulling or weaving. Handloom is a cottage industry in Shantipur Block and this industry is famous for “Shantipur Tant (cotton) Saree”. Some of the displaced people in this village were weavers. Due to river bank erosion previous production set-ups were lost, and they had to rebuild their handlooms in new settlements. But this process could not be continued since displacement occurred more than one time. In the long run, their capitals were eroded gradually as they had to shift several times. Some of these distressed people even migrated to Mumbai and Delhi to work as assistants to the jewellers. However, this study is lacking some important analysis, like loss in income and reduction in essential expenditures, to identify their distress. Their deterioration in health and educational status due to forcible displacement was not evaluated, which would be highly required for such studies. Also, social security of the displaced people needs to be assessed. The Ganges bank erosion in other districts of West Bengal is less important compared to the Malda and Murshidabad districts. Until now, more than 700 000 people in these two districts have been displaced due to Ganges bank erosion (Mukherjee, 2008). There is a general tendency of River Ganges to shift towards the left bank above Farakka Barrage (Malda district), and towards the right bank below Farakka Barrage (Murshidabad and other districts). The river has so far eroded 356 km2 of fertile land from the district of Murshidabad (Rudra, 2005*). It has been reported that nearly 80 000 people in this district were displaced only during 1988 – 1994 (Rudra, 2005). Land loss due to erosion in Malda is worse, too. More than 200 km2 of fertile land in Malda district have been completely wiped out untill 2004. The displacement of erosion ehich affected people in these two districts is typical. It is of the nature of “continuous forced migration”, i.e., displacement, then settlement, then displacement, then again re-settlement and so on (Figure 11*). This observation has been supported by analysis of the changing morphometry of the river in this place (Laha and Bandyapadhyay, 2013). The analysis showed a drastic increase in sinuosity (i.e., meandering), braidedness index, and percentage of the island area to the total river reach area over the period of time 1955 – 2010. By increasing sinuosity, the river has been engulfing the large areas of left bank every year, and due to increasing braidedness new areas emerged. Firstly, when their own homeland is submerged due to bank erosion the people rush to land (sand bed) emerging out of the river (locally called “char”). But these fragile lands emerge, submerge and re-emerge continuously. This phenomenon has been explained in Section 2.1. The frequent “displacement and settlement” of victims is one of the consequences of bank erosion in Malda and Murshidabad. Another consequence is border dispute. Some parts of the river bank lines are considered as inter-state or inter-country borders. This has happened between West Bengal and Jharkhand in the Malda district. River-course changes due to bank erosion (submerge of land on the left bank and emergence of new land on the right bank of the river). The new land is no more considered as a part of West Bengal in spite of land loss in this state (Figure 5*). Problems arise when erosion-afflicted people belonging to this lost land move to the newly emerged highland on the opposite side of the river, which is now in Jharkhand. Previously they belonged to West Bengal and they had all the identity documents (namely voter identity card and ration card) of this state. So, they are not recognised as residents of Jharkhand and they suffer from the deprivation of getting civic amenities, like health and education. They even cannot take the advantages of different government programmes, like the National Rural Employment Guarantee Scheme, which provides 100 days of guaranteed work to rural unemployed. Figure 11: Continuous process of forced migration. The border dispute due to the Ganges bank erosion in Murshidabad district is, however, related to the inter-country border between India and Bangladesh. One branch of the River Ganges flows into Bangladesh after flowing along the border of Murshidabad for 60 km (Figure 6*). The erosion has wiped away the boundary posts at many places on the Indian side. Along with the erosion of the river bank and the border posts on the Indian side (in Murshidabad), new sand lands (i.e., “chars”) have developed towards theBangladesh side. As per official estimate, more than 100 km2 of sand lands have emerged along the opposite bank till 1992 – 1994. A sizeable affected population have migrated from the eroded land on the Indian side to the newly emerged lands on the Bangladesh side. These emerged lands are not easily accessible from the Indian side and the people have to cross the River Padma, taking several hours to come to India. However, Bangladesh is easily accessible from these lands. It takes less than an hour to travel by road from Rajshahi town in Bangladesh to these newly emerged lands. The situation there has become complicated, as the Bangladesh government does not agree to establish any border line across these newly emerged lands and the Indian government cannot provide proper security to the new settlers. So, the migrated people in these islands often are in conflict, especially at the time of harvesting, with Bangladeshi cultivators who have more easy access. The basic infrastructure (like health centre, school and market) in the new lands is very poor. This is similar true in the new settlements of displaced people of both districts. Due to lack of educational institutions and economic distress, education has got the least priority among these displaced people. It has been observed in these areas that children and even youths have never been to a school and are illiterate. Regarding health, most of the children suffer from malnutrition, and there are several reports of child death due to malnutrition. Immunisation of children cannot be imagined in most of the resettlements. Sometimes deaths of pregnant women were reported because of their delayed arrival at hospitals. The only way to travel from resettled islands (chars) to any hospital on the main land is waterways and the travel time is several hours by boat. These places are also lacking market places or shops, mainly because of economic distress. Thus, an informal sector has not been generated in these places, which can reduce unemployment. This is one of the reasons for these people’s involvement in criminal activities. The other dimension of such displacement-related crisis is women’s vulnerability to this kind of disaster. Some State Governments indeed have initiated, although with a vision of very short-term planning, some sort of rehabilitation and compensation programmes. It has been observed in the Malda district, that a considerable proportion of displaced people are women (O’Neil, 2010). Generally, women suffer most in any course of forced migration, because they have to carry the whole responsibility of households chores starting from cooking and looking after children to caring for the old and sick of the family. It becomes difficult for them to perform these day-to-day activities in resettled odd places (like “chars”) without civic facilities and easy availability of natural resources. Women’s role is always ignored in any rehabilitation programme. Gender-sensitive rehabilitation policies, therefore, are urgently needed to ease women’s helplessness in carrying out household’s responsibilities during the displacement and rehabilitation process. The rural population in the Malda district is mainly vulnerable to two types of shock – economic and ecological (DHDR, 2007*). The DHD report has specified the conversion of land from agriculture to commercial orchard and other forms of non-agricultural land use as economic shock, and flood and river bank erosion as ecological shock. These two types of shock affect development processes to widen livelihood opportunities among vulnerable sections of rural population, and make their lives more insecure. 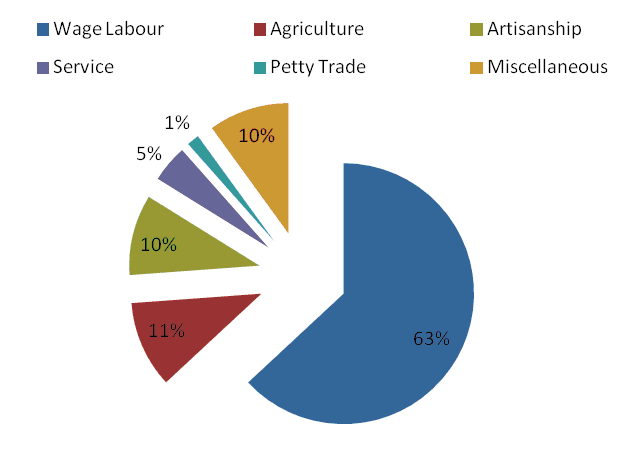 Moreover, it has been observed through survey investigation that the vulnerable population, in both the cases of ecological and economic shock, is mostly the landless labourers (Figure 12*). River bank erosion is occurring in other regions too, but not to the extent as in Brahmaputra region or lower Ganges region. One example is the river erosion in Uttar Pradesh of the River Ghaghara, which flows from Nepal into Northern India (Figure 4*). The River Ghaghara is a major left bank tributary of the River Ganges. It has changed its course since 1995 causing vast erosion of the river bank, especially after 1998 (International Fact Finding Mission, 2005). Due to this erosion more than 5000 thousand households have lost their houses and means of livelihood. Affected households did not get any compensation for their cultivable land, but got offered a relief package of a small amount of money and a housing plot (not sufficient for cultivation) in the same district. It was supposed that these displaced people who were previously farmers would accept relocated housing plots and go for alternative occupations, like the international refugees who are forced to accept major changes in their livelihood. But here it did not hold true. Most of them did not accept that relief package, mainly because there were no opportunities of earning income in the area where they were relocated. They demanded land for agriculture, which was their occupation, or land in locations where there are means of livelihood. It was reported that people who lost their houses and cultivable land, and did not accept relief package, were working in informal sectors like rickshaw-pulling, labour in brick kilns, etc. As a result, dissatisfaction prevailed among both the authorities and the victims. However, new sandy land has emerged on the opposite riverbank, and in the middle of the river with the changing course of the river like that in Malda and Murshidabad. This land, untill the time of study, was nobody’s land, and these people could be relocated in this newly emerged land to continue their agriculture occupation. But lack of infrastructure is one of the main barriers to settle in such emerged land. Firstly, there is no easy access to this land. Few people, who have already occupied some area of this land, reported that they can cross the river by boat by paying fare, which they cannot afford. Secondly, there is no medical care facility. The combination of these two difficulties caused some cases of death. There was a suggestion for erection of a pontoon bridge to enable the erosion victims an easy access to this land. Another state which is affected by river bank erosion is Orissa. The river Mahanadi, the biggest river in the state, and its two branches, Kathajodi and Kuakhai, are constantly expanding and changing their course (Pati, 2009). Every year, a few villages are swallowed by these rivers. Thousands of people have already become victim of erosion or are living in a threat of being washed away by these three rivers. These people have no alternative place to migrate and the government is not acknowledging the erosion problem. Living Rev. Landscape Res., 8 (2014), 3, doi:10.12942/lrlr-2014-3, URL (accessed <date>): http://lrlr.landscapeonline.de/lrlr-2014-3.